With the ESP LTD F-5E Natural Satin, the Hard'n'Heavy specialists from Tokyo present a five-string electric bass that skilfully combines the aggressive F-Series design with all the characteristics of a pure noble bass. The electric bass not only has a full neck, but also a noble ebony fretboard and top, while the combination of ESP humbuckers and active 3-band tone control promises versatile sounds for rock and metal. Noble bass in aggressive metal design: The ESP LTD F-5E Natural Satin combines first-class woods with versatile sounds. The heart of the ESP LTD F-5E is undoubtedly the full-length maple neck with mahogany stripes, to which mahogany body wings are glued with a thick ebony top. In combination with the extra long 35" scale this combination promises a powerful basic sound with tight articulation, which also reproduces the low B-string full and precise. 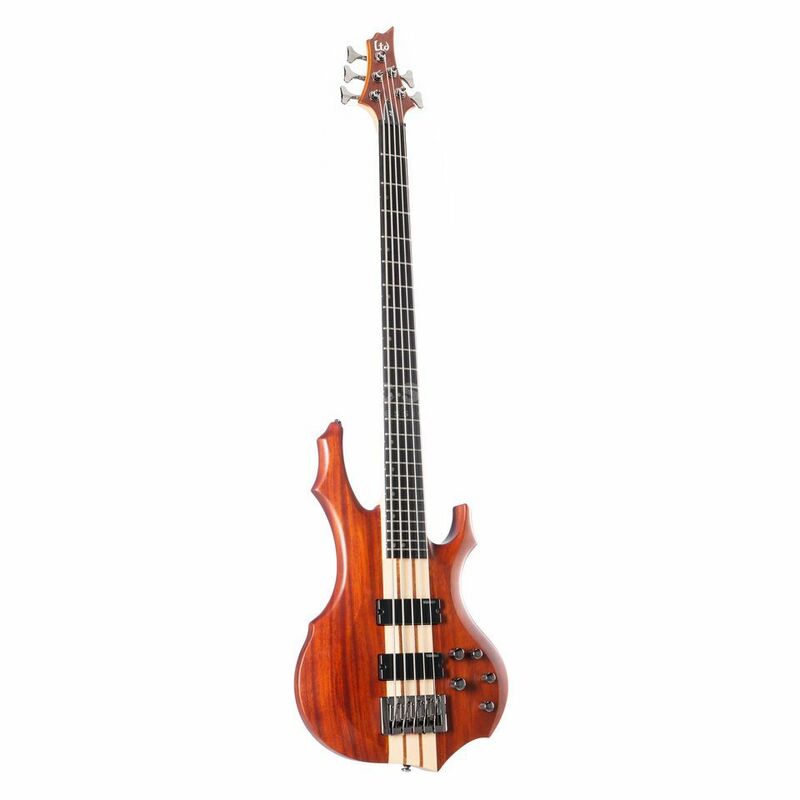 When playing the electric bass, the neck with the flat "Extra Thin U"-profile and the fingerboard with 45 mm saddle width offers the perfect basis for breakneck riffs and complex runs. The ESP LTD F-5E uses two passive humbuckers in the form of the ESP Designed SB-5N on the neck and the ESP Designed SB-5B on the bridge. These pickups convince with their broadband sound, which offers the perfect basis for tight riffs and pushing grooves with well-defined attack and lively tone development. To further adjust the bass sound, the ESP LTD F-5 Bass is also equipped with the active ESP ABQ-3 3-band tone control, which convinces with its musical tuning and allows precise interventions in the character-forming frequencies. The ESP LTD F-5E is completed by high-quality hardware equipment that can handle even the toughest stage applications with unrestricted functionality and robustness. The ESP LTD BB-605 bridge is used as a bridge on the body, which supports the even sound development of the bass. With its two-dimensionally adjustable strings, it also guarantees perfect intonation and string position, while the strings to be suspended from above make it easier to change strings. At the headstock, the strings are guided from the saddle of self-lubricating plastic with straight pull to the ESP LTD tuners, which convince with high precision running and high tuning stability.